ANdAL is an avathAram of bhUdhEvi nAchchiyAr, the divine consort of srIman nAryAyaNan. bhUdhEvi nAchchiyAr appears in this world as ANdAL (also known as gOdhA dhEvi) to explain the glories of emperumAn in very simple thamizh and help the jIvAthmAs to relieve their sufferings in this samsAram and accomplish the true goal of every jIvAthmA - blemishless kainkaryam to emperumAn. She compiled two dhivya prabhandhams when she was very young. 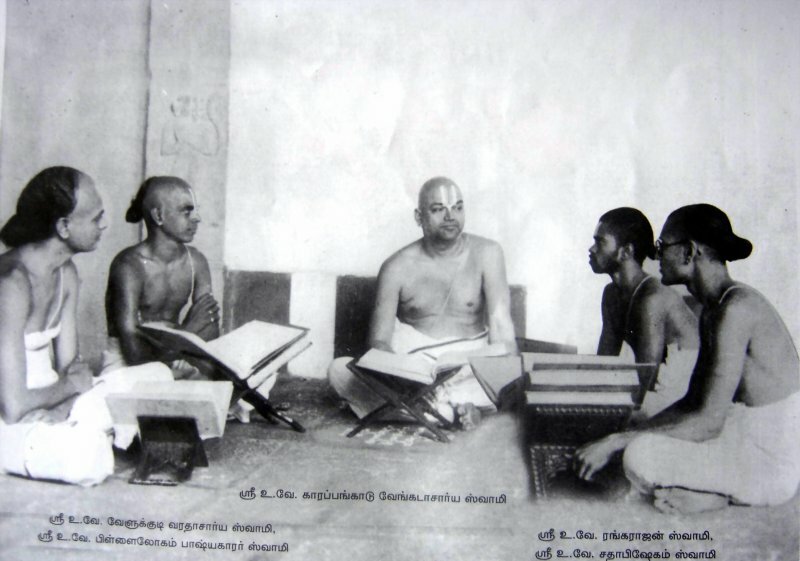 First, she sung thiruppAvai, requesting emperumAn to engage her in his kainkaryam, purely for his own pleasure. Subsequently, since emperumAn did not fulfill her request, with great sorrow out of the separation from emperumAn, she sung nAchchiyAr thirumozhi and finally periya perumAL invites her to srIrangam and accepts her and she returns back to paramapadham leaving us behind these two precious gems (thiruppAvai and nAchchiyAr thirumozhi). Many pUrvAchAryas like emperumAnAr, bhattar, periyavAchchAn piLLai, piLLai lOkAchAryar, azhagiya maNavALa perumAL nAyanAr, vEdhAnthAchAryar, maNavALa mAmunigaL, ponnadikkAl jIyar, etc have glorified ANdAL and her thiruppAvai through their pAsurams, sthOthrams, aidhihyams and/or vyAkyAnams. thiruppAvai removes our hurdles in accomplishing the ultimate goal - kainkarya prApthi for his pleasure and leads us to emperumAn's thiruvadi. It is the essence of all the vEdham. One who does not know thiruppAvai is just a burden for this earth. 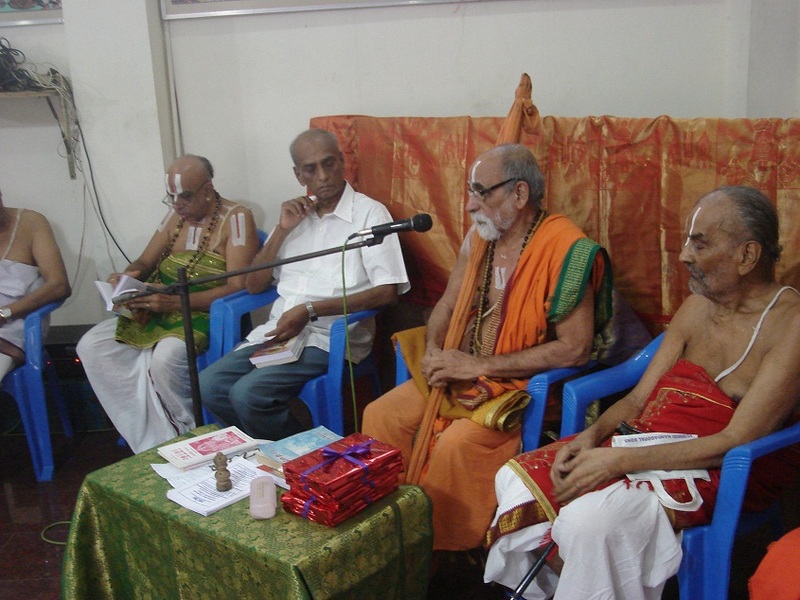 It is seen that, every mArgazhi month, thiruppAvai is recited, lectured, spoke about and written about every where. Right from a 3 year old child to a 90 year old elder can be seen engaged in thiruppAvai anusandhAnam. Such is its power and attraction. And all of that is because, ANdAL presented all the essence of the sAsthram in these 30 pAsurams. So, what is the essence of sAsthram? It is explained by nammAzhwAr in the simplest terms in thiruvAimozhi 4.6.8 - "vEdham vallArgaLaik koNdu viNNOr perumAn thiruppAdham paNi" (வேதம் வல்லார்களைக் கொண்டு விண்ணோர் பெருமான் திருப்பாதம் பணி) meaning one should take the help of the experts of sAsthram (pUrvAchAryas) and approach emperumAn through nithyasUris (periya pirAtti, etc) and serve the divine lotus feet of emperumAn. NammAzhwAr who was blessed with divine blemishless knowledge explains the essence of sAsthram in such simplest terms. If only every jIvAthmA understands this and puts it into practise, he will definitely accomplish the ultimate goal of blemishless eternal service to emperumAn. azhagiya maNavALa perumAL nAyanAr who is the younger brother of piLLai lOkAchAryar, has done a wonderful elaborate vyAkyAnam for thiruppAvai. His expertise in aruLicheyal is unparallel to any one. For example, he has explained all of the rahasya thrayam (thirumanthram, dhvayam and charama slOkam) fully using the words from aruLichcheyal in a beautiful prabhandham called aruLichcheyal rahasyam. ANdAL's greatness is because of the specific fact that she included everyone in bhagavath anubhavam. It is said in sAsthram that "Eka svAth na bhunjItha", one should not enjoy anything alone without sharing the same with others. This is most applicable in bhagavath vishayam. While vishayAntharam (pleasures of this material world) is privately enjoyed because of its defective nature, bhagavath vishayam on the other hand is common to all and is to be shared and enjoyed together. ANdAL showed this by her own anushtAnam to us. Following in the foot steps of his father who invited aishvaryArthis (one who is looking for wealth), kaivalyArthis (one who is looking for AthmAnubhavam) and bhagavath kainkaryArthis (one who is looking for bhagavath kainkaryam) to do mangaLAsAsanam to emperumAn in his thiruppallANdu, ANdAL also invites every one to engage in bhagavath kainkaryam. In his 6000 padi vyAkyAnam, in the avathArikai of the vangak kadal (last) pAsuram, nAyanAr beautifully summarizes the meaning of each of the first 29 pAsurams in thiruppAvai. nAyanAr's expertise in explaining the essence of the whole pAsuram in a single line will be greatly appreciated by true scholars. Let us now see the essence of thiruppAvai through those divine words. In the 1st pAsuram, ANdAL is celebrating the kAlam (time - mArgazhi month, beautiful day), gOpis and gOpas who are fully dependent on kaNNan emperumAn and who help her engage in krishNAnubhavam and emperumAn himself who is shown by ANdAL as both upAyam (means) and upEyam (goal). While her primary goal is to engage in krishNAnubhavam, she performs the sankalpam (vow) to observe the nOnbu (as a secondary reason) to engage herself and all her gOpikA friends in bhagavath anubhavam. In the 2nd pAsuram, she identifies what is to be accepted and what is to be rejected while wanting to engage in bhagavath anubhavam. She clearly establishes that "mElaiyAr cheyvanagaL" (மேலையார் செய்வனகள்) meaning that which is observed by our elders (pUrvAchAryas) is the most important pramANam for us (prapannas). In the 3rd pAsuram, she desires for the well being of all the people of vrindhAvan as a consequential (secondary) benefit because they are the ones who allowed her and her friends to engage in krishNAnubhavam. The primary goal is ofcourse krishNAnubhavam for every one. In the 4th pAsuram, she orders the parjanya dhEvan (rain god) to bring in sufficient rain (3 times a month - once every 10 days - once for the brAhmANas, once for the king and once for the chaste women), so the people of vrindhAvan can be prosperous and the krishNAnubhavam can happen uninterruptedly. In the 5th pAsuram, she identifies that by constantly engaging in nAma sankIrthanam, the karma (virtues and vices) of the past and future will be destroyed. As shown in the upanishadhs when some one surrenders to emperumAn, their previous karma are removed like cotton being destroyed by fire and their future karma will be removed like water does not stick to a lotus flower. It is also to be clearly understood that all the past karmA will be removed unconditionally by emperumAn. But for the future, only karma which gets accrued out of any action that is done unintentionally are removed and any karma which gets accumulated intentionally will have to be exhausted by reaping the fruits of the same. From the 6th pAsuram to 15th pAsuram, ANdAL goes to 10 different gOpis' (who are totally attached to kaNNan emperumAn) houses to wake them up. While going there, she brings along several other gOpis who are very eager finally go to kaNNan emperumAn's thirumALigai. In the 6th pAsuram, she wakes up a gOpi who is very new to krishNAnubhavam. This means, this gOpi is satisfied with just enjoying kaNNan emperumAn on her own - that is the initial stage - prathama parva nishtai. Once, when the underlying principle of bhAgavatha samslEsham (association) is understood, that will lead to charama parva nishtai. In the 7th pAsuram, she wakes up a gOpi who is expert in krishNAnubhavam, but still purposefully waiting inside to hear the beautiful voices of ANdAL and her friends. In the 8th pAsuram, she wakes up a gOpi who is very excited (and unable to sleep) because of her being much liked by kaNNan emperumAn and having greatness due to that. In the 9th pAsuram, she wakes up a gOpi who is very determined in emperumAn being the upAyam and who enjoys different experiences with him. She is like sIthA pirAtti who said to hanumAn "let srI rAman come and rescue me". In the 10th pAsuram, she wakes up a gOpi, who is very dear to kaNNan emperumAn. She is explained as a sidha sAdhana nishtar, one who has surrendered fully to emperumAn and so emperumAn likes her the most. In the 11th pAsuram, she wakes up a gOpi who is the most favourite girl of vrindhAvan (just like kaNNan himself is the most favourite boy of vrindhAvan). In this pAsuram the importance of performing one's varNAsrama duties perfectly is emphasised. In the 12th pAsuram, she wakes up a gOpi who is the sister of kaNNan emperumAn's most dear friend who does not perform any varNAsrama duties. When engaged in constant loving service to emperumAn, one may not have the time and necessity to perform their external duties. But the moment one is relieved from the devotional service to emperumAn, the other duties immediately resume and assumes importance. In the 13th pAsuram, she wakes up a gOpi who is enjoying the beauty of her eyes herself privately. eyes generally mean jnAnam - here since she has full knowledge about emperumAn, she thinks that kaNNan emperumAn will come to her automatically. Since kaNNan emperumAn is aravindha lOchanan (lotus eyed) this gOpi who has beautiful eyes is explained as a good match for him. In the 14th pAsuram, she wakes up a gOpi who commits herself to come and awake everyone else but forgets about her commitment and is still staying in. In the 15th pAsuram, she wakes up a gOpi who is waiting to behold the beautiful sight of ANdAL and all her friends arrive at her thirumALigai. In the 16th and 17th pAsurams, she wakes up the local representatives for nithya sUris viz kshEthra pAlakas (security guard for the main entrance), dhvAra pAlakas (gate keepers), Adhi sEshan, etc. In the 16th pAsuram, she goes to wake up the security guards at the main entrance and the gate keepers outside the room of SrI nandhagOpan. In the 17th pAsuram, she wakes up SrI nandhagOpan, yaSOdhA and balarAman. In the 18th, 19th and 20th pAsurams, since she could not awake kaNNan emperumAn, she realised that she is missing the purushakAram of nappinnai pirAtti. In these 3 pAsurams, ANdAL glorifies nappinnai pirAtti's greatness, intimate dealings with kaNNan emperumAn, unlimited pleasure potency, delicate nature, beautiful form, being the lovable darling of kaNNan emperumAn and finally her purushakArathvam (recommendation capability) towards emperumAn. It is explained that desiring for emperumAn ignoring pirAtti is like the desire of sUrppaNakai (who just wanted srI rAman) and desiring for pirAtti ignoring emperumAn is like the desire of rAvaNan (who just wanted sIthAp pirAtti). It is identified that the 18th pAsuram, undhu madhakaliRRan pAsuram is very dear to emperumAnAr. In the 21st pAsuram, she glorifies kaNNan emperumAn's great qualities such as being born as the dear son of SrI nandhagOpan, his parathvam (supremacy), his dhruda prAmAnyathvam (established by SAsthram that he is the supreme), etc. In the 22nd pAsuram, she informs to emperumAn that she along with her gOpi friends have no other refuge and they have come to emperumAn like vibhIshaNan who had come to take shelter of srI rAman. She also informs to emperumAn that she has given up all other attachments and only want his divine blessings. In the 23rd pAsuram, when kaNNan emperumAn feels that he made ANdAL wait for so long and asks her what she needs, she requests emperumAn to arise from his bed, walk a few steps and seat himself in his simhAsanam and then listen to her in the assembly like a lion king. In the 24th pAsuram, having seen him seated, ANdAL happily performs mangaLAsAsanam to him. Naturally, being the daughter of periyAzhwAr, her ultimate goal is to perform mangaLAsAsanam to emperumAn. Just like sIthA pirAtti, rishis of dhandakAraNyam, periyAzhwAr, etc., ANdAL and her friends also perform mangaLAsAsanam to emperumAn as soon as they see him walk and realised they made him walk with such tender lotus feet. In the 25th pAsuram, emperumAn asks them if they really require anything for the nOnbu and they say since they have glorified emperumAn's divine qualities all their sorrows are removed and they really only want kainkaryam to him. In the 26th pAsuram, she reveals that she needs some instruments for her nOnbu. While ANdAL previously said she did not require anything other than emperumAn, now she asks for some instruments such as his pAnchajanyam, some kainkaryaparars to do mangaLAsAsanam for him, a lamp to see his face clearly, a flag showing his presence from distance and a protective cloth which acts like an umbrella. It is explained by our AchAryas that ANdAL requires these so that krishNAnubhavam can be done fully and perfectly using these instruments. In this pAsuram, it is shown by ANdAL herself emperumAn's love towards ANdAL her friends is far greater than their love towards him. In the 27th and 28th pAsurams, prApyam (goal) and prApakam (path/means) are clearly established as "emperumAn only" by ANdAL. In the 27th pAsuram, emperumAn's special quality which brings both anukUlars (bhakthas who are favourable) and prathikUlars (enemies or the ones who dont accept emperumAn towards him is explained by ANdAL. She also establishes the nature of the ultimate result/goal (kainkaryam) which is sAyujya mOksham which means eternally serving emperumAn for his pleasure without interruption. In the 29th pAsuram, she reveals the most important principle, that kainkaryam is for the pleasure of emperumAn (not herself). She also says that, all along she took up the nOnbu as a vyAjam (a reason), out of her extreme desire to engage in krishNAnubhavam. In the 30th pAsuram, since emperumAn agrees to fulfill her desire, she sings now as ANdAL herself (all the first 29 pAsurams are sung in gOpi bhAvam). She declares that any one who learns and sings these 30 pAsurams, even though they may not have the same pure bhAvam like herself, will get the same kainkarya prApthi like her. This means that by the merciful heart of ANdAL, the result will be the same for - gOpis who had immense love for kaNNan emperumAn when he was present in vrindhAvan, ANdAL who manifested the same bhAvam in srIvilliputhUr and any one who subsequently learns and recites the same. bhattar identifies that "Just like a cow which lost its calf will still give milk seeing a fake calf (made of straw covered with the skin of the calf), even when some one recites these pAsurams (that were sung by the ones who are dear to emperumAn), we will also get the same result as them". ANdAL ends thiruppAvai with the charithram of churning the kshIrAbdhi (milk ocean) since the gOpis wanted to have kaNNan emperumAn and to get emperumAn we need pirAtti's purushakAram and emperumAn churned the milk ocean mainly for him to bring her out of the ocean and marry her. Hence ANdAL completes this prabandham highlighting this incident. Since she is AchArya abhimAna nishtai, she finishes the prabhandham saying that she is pattarpirAn kOthai (daughter of periyAzhwAr). Thus, nAyanAr beautifully summarizes the whole of thiruppAvai in one big paragraph in the avathArikai - such is his scholarship. 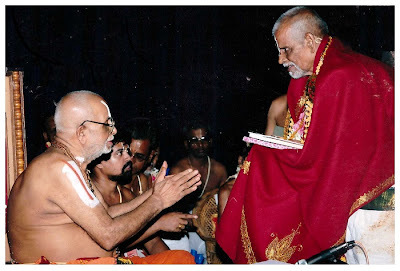 We are not qualified to talk about his scholarship but we cant help but be amazed by his intellect and when such intellect is blended with immense bhakthi towards emperumAn, the result is great bhagavath anubhavam for us. 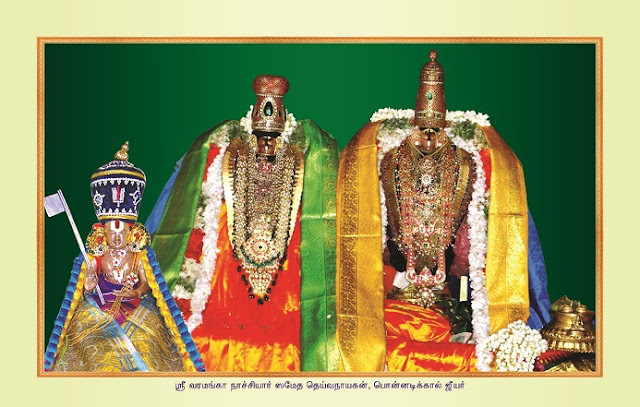 thiruppAvai is glorified so much by our pUrvAchAryas and has a very unique place in our sampradhAyam and nithya anusandhAnam. Let us pray at the lotus feet of ANdAL, so we can also develop atleast a small fraction of her love towards emperumAn and bhAgavathas. 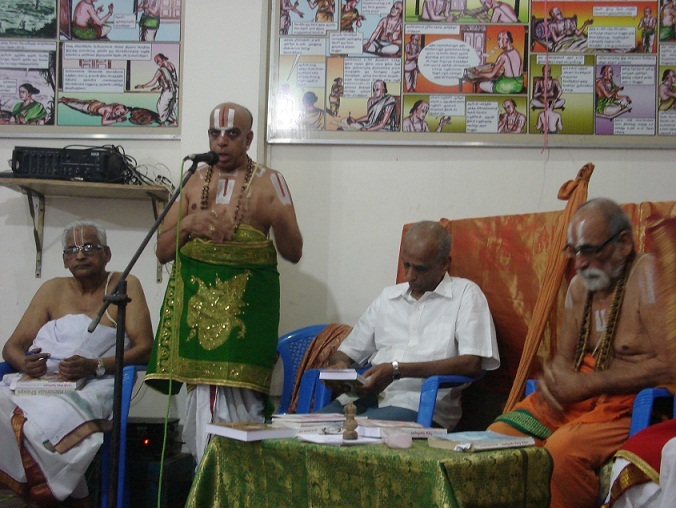 srIman nArAyaNan blessed AzhwArs with divine blemishless knowledge. 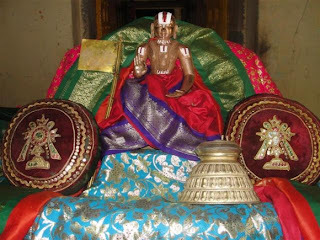 Among the AzhwArs, nammAzhwAr is the leader and is known as vaishNava kula pathi. 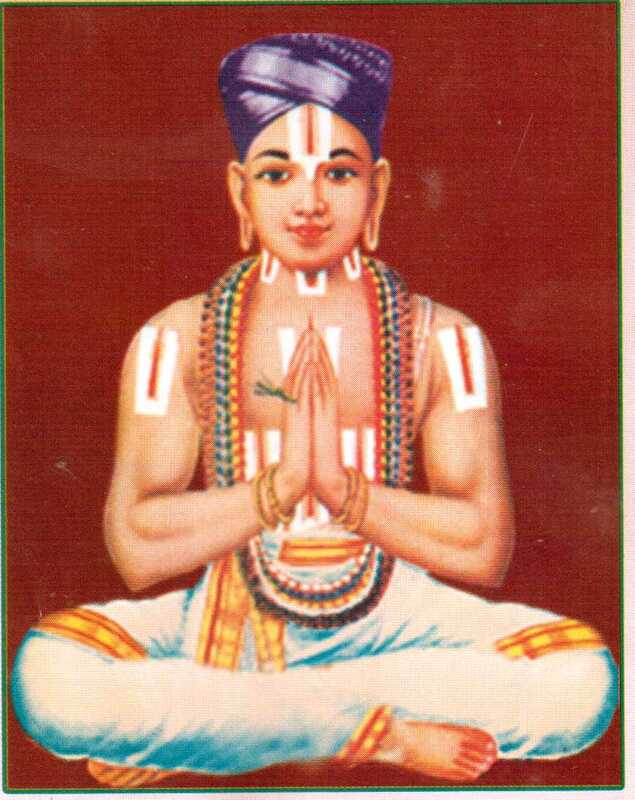 nammAzhwAr is popularly known as "vEdham thamizh cheytha mARan" (வேதம் தமிழ் செய்த மாறன்). He blessed us with 4 dhivya prabhandhams viz thiruvirutham, thiruvAsiriyam, periya thiruvanthAdhi and thiruvAimozhi. These 4 prabhandhams bring out the essence of rig, yajur, atharvaNa and sAma vEdhams. azhagiya maNavALa perumAL nAyanAr identifies in his AchArya hrudhayam chUrNikai 51 that, just like rig vEdham expanded itself into sAma vEdham when added with divine sounds and tunes, each pAsuram in thiruvirutham (which is rig vEdha sAram) expanded into thiruvAimozhi (sAma vEdha sAram). While nAyanAr identified this, there is not much information available in our pUrvAchArya works which show the direct link. In the recent past (last 100 years or so), some great srivaishnava scholars have attempted to bring out this link between thiruvirutham and thiruvAimozhi. One such swamy is srI U.Ve. vai, mu. satagOpa rAmAnujAchAryar who established showed the connection between the two prabhandhams. As part of his simple translation/purports to thiruvirutham book, in the end, he added a section where this link is shown between each pAsuram in thiruvirutham to a particular padhigam in thiruvAimozhi where the same message is conveyed. Our grand father "kainkarya srImAn" AzhwAr thirunagari sri U.Ve. 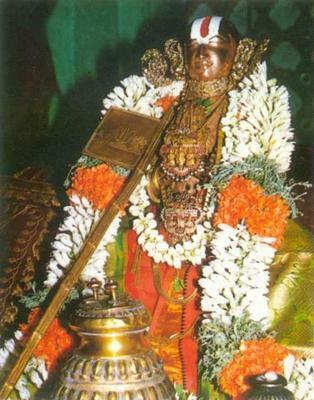 AthinAtha iyengAr swAmy attained AchAryan thiruvadi on November 22nd, 2012. 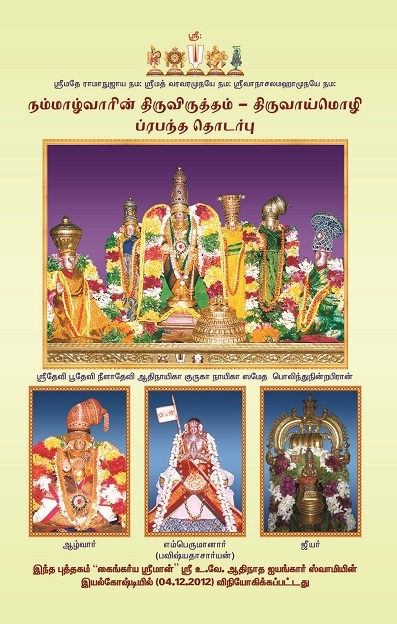 On the occasion of his iyal gOshti (December 4th, 2012), we released this book which contains the sangathi (relationship) between thiruvirutham and thiruvAimozhi. srI U.Ve. AthinAtha iyengAr swAmy was born in the year 1922 in the great thiruvamsam (family lineage) of komANdUr iLayavilli (a cousin of emperumAnAr like embAr - son of emperumAnAr's mother's sister's son). komANdUr iLayavilli is well known for giving up his own life due to the deep sorrow in separation after seeing a divine svapnam of emperumAnAr ascending to parampadham. The ancestors of this swAmy were living in thiruchithrakUdam and at some point took shelter of vAnamAmalai jIyar swamy long ago. He is also the younger brother of asmadhAchAryan srImath paramahamsa ithyAdhi pattarpirAn jIyar swamy (vAnamAmalai mutt - 29th pattam) in his pUrvAshramam. 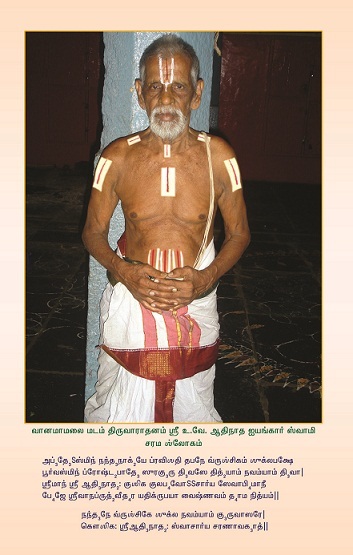 asmadhAchAryan used to say that our grand father was brought to the mutt right after his upanayanam during the times of srImath paramahamsa ithyAdhi chinna kaliyan swAmy (vAnamAmalai mutt - 25th pattam) and had his pancha samskAram done. 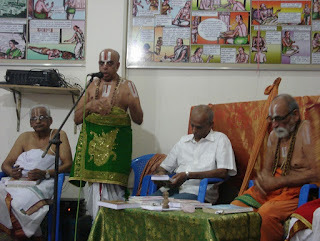 Some time after that he started performing various kainkaryams at the mutt ranging from thirumadappaLLi, thiruvArAdhanam, jIyar swAmy antharanga kainkaryam (confidential services), etc. During the times of chinna rAmAnuja jIyar swamy (27th pattam), AthinAtha iyengAr swAmy performed all kainkaryams to jIyar swAmy and remained a close confidante for that swAmy. 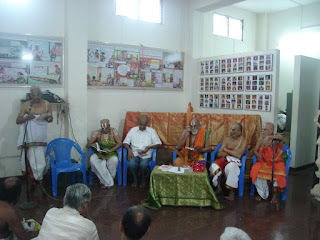 He was also performing manthra pushpam kainkaryam to dheivanAyakan emperumAn every day. Overall, He served emperumAn and 6 jIyar swamys continuously for more than 75 years. 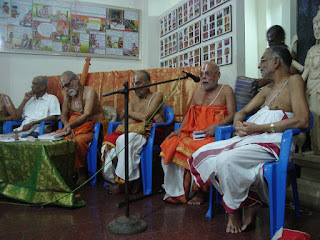 He was well versed in ubhaya vEdhAntham and vaidhIha karmAnushtAnams. His AchAram and anushtAnam are unparallel to anyone else. He led a very simple life without leaving vAnamAmalai unless it is absolutely necessary. Even during his final days (when he was 90 years old), he used to go to the pond inside the mutt there, take bathe, bring water in a pot to his thirumALigai, perform sandhyAvandhanam, thiruvArAdhanam, etc and also go to the temple and mutt for his regular kainkaryams. Even on the final day when he was conscious and able, he did thiruvArAdhanam to aranganagarappan (vAnamaAmalai mutt thiruvArAdhana perumAL) and returned home. Many wondered his commitment and life style and on his demise commented that "an era is ended in front of us". Such was his greatness. He was always an inspiration for us. He lived a long life without ever having to step into a hospital (except just once for a cataract operation) or taking any medicines. Even during his final days, he stayed peacefully and emperumAn took him away from us without giving him any difficulty. He was recognised and awarded by varthamAna kaliyan rAmAnuja jIyar swAmy in 2003 during lakshdvIpa mahOthsavam. Also, he was awarded the title "kainkarya srImAn" by kinchithkAram trust of vELukkudi krishNan swAmy in 2009. It is a great fortune and blessing for us to be born as his grand sons and we took the opportunity of his iyal gOshti to quickly compile and release the thiruirutham - thiruvAimozhi sangathi book. This book can be downloaded from the following link: https://docs.google.com/open?id=0ByVemcKfGLucLXJpakgxSGtJTFU. 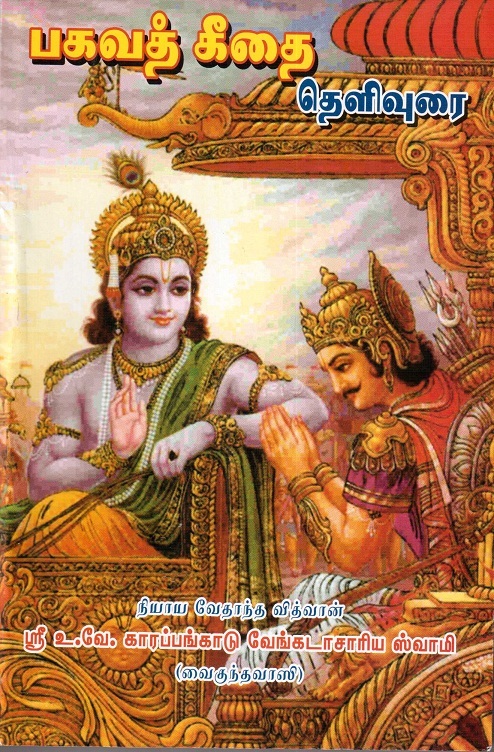 kaNNan emperumAn directly spoke bhagavath gIthai to arjunan amidst the battle field. piLLai lOkAchAryar explains that "emperumAn also likes to take the position of AchAryan which is why he became gIthAchAryan". He also explains that gIthai was spoken mainly to have draupathi's desires fulfilled - emperumAn had such great attachment to draupathi that even while ascending to paramapadham he said "I have not done enough to reciprocate the love showed by draupathi towards me". 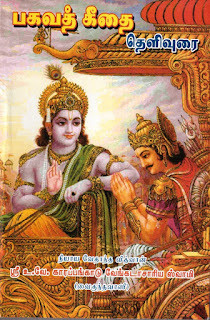 ALavandhAr explains in gIthArtha sangraham that "kaNNan emperumAn spoke bhagavadh gIthai to arjunan since arjunan was confused and he showed mercy and friendship to the ones who dont deserve that and as a result of arjunan's act the whole world benefited". emperumAnAr, being jagadhAchAryan explained the meanings of bhagavath gIthai through his gIthA bhAshyam, as it is essential for an AchArya to explain the intricate meanings clearly to the followers of vaidhIka matham - sanAthana dharmam. 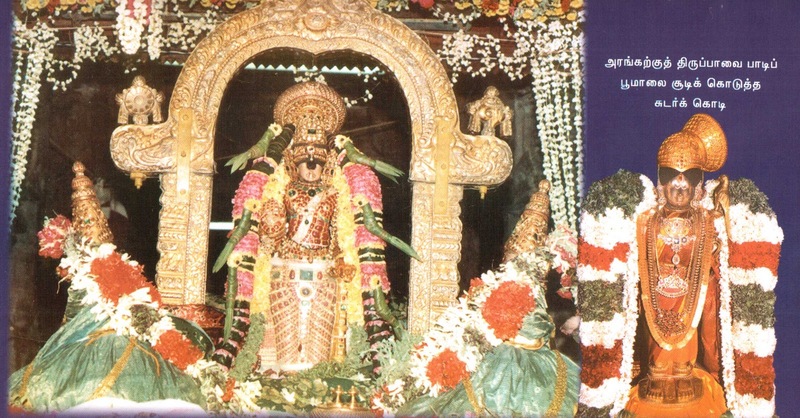 kArappangAdu srI U.Ve. 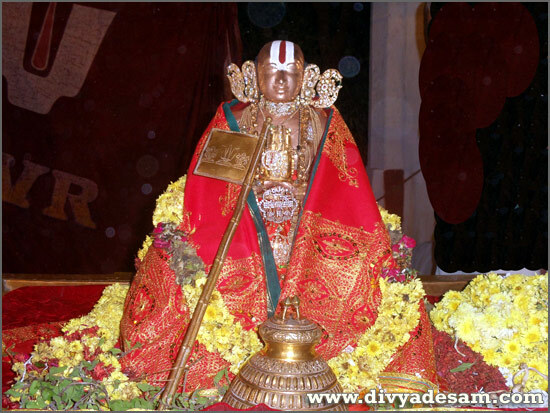 vEnkatAchAryar swamy was a great exponent of ubhya vEdhAntham (both samskritha vEdhAntham and dhrAvida vEdhAntham). His discourses/lectures mesmerized many, even vidhwAns from other sampradhAyams had great respect for the way swAmy explained the in-depth meanings. He nurtured and developed many great scholars such as vELukkudi sri U.Ve. varadhAchAryar swamy, sri U.Ve. sathAbishEgam gOvindha narasimhAchAryar swamy, sri U.Ve. 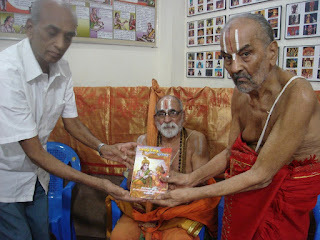 piLLai lOkam bhAshyam swamy, kumAravAdi sri U.Ve. rAmAnujAchAr swamy (currently srImath paramahamsa ithyAdhi embAr jIyar swamy), etc. One of his kAlakshEpa sishya named sri U.Ve. srInIvAsa iyengar swamy documented his many lectures of gIthai and published this for the benefit of the whole srivaishnava community. This book was republished recently and a book release function was organized at NampiLLai sannidhi on December 28th, 2012. embAr jIyar swamy has put in lots of personal efforts to have this wonderful book released. This function was headed by srImath paramahamsa ithyAdhi embAr jIyar swamy and many noted vidhwAns such as Dr U.Ve. V V Ramanujam swamy, sri U.Ve. N S Krishna iyengar swamy, Dr U. Ve. 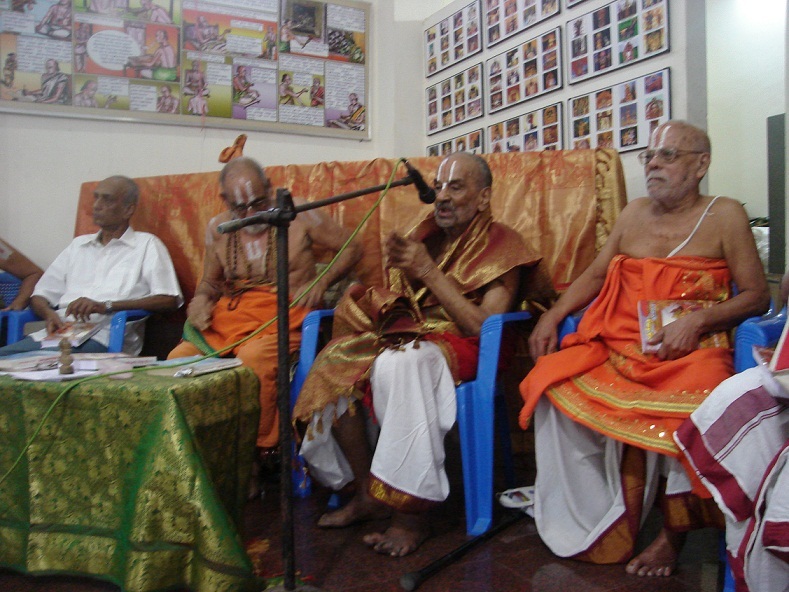 M A Venkatakrishnan swamy, etc., participated and addressed the gathering and brought out fond memories about karappangAdu swamy. This book is published by Thirumal padhippagam, 20/53 Abraham street, Mylapore, Chennai 600004, Ph: 044-24954247. You can also contact chinnu swamy at 9791111307 for copies. The cost of the book is just 200 Rs. We encourage everyone to get a copy of this wonderful book and enjoy reading the same. A summary of all events that are identified in this divine grantham. nAyanArAchAn piLLai salutes his AchAryan periyavAchAn piLLai and identifies the purpose/content of the grantham which is to establish the full glories of jagadhAchAryan srI rAmAnujar and that he is the ultimate path for srivaishnavas to accomplish their ultimate goal. emperumAnAr is identified as the precious stone at the center of our AchArya rathna hAram. svAnuvruthi prasannAchAryas and krupA mAthra prasannAchAryas explained in detail; krupA mAthra prasannAchAryas' importance is highlighted and emperumAnAr's uththArakathvam (saviourship) is established. emperumAnAr's thirumudi (upward) sambandham is discussed here. nammAzhwAr shows nAthamunigaL the beautiful form of bhavishyadhAchAryan (future AchAryan) and blesses him with the bhavishyadhAchAryan vigraham. "poliga poliga" pAsuram is beautifully explained by nammAzhwAr in context of rAmAnujar who is to appear in the future. nAthamunigaL passes on the divine incidents and bhavishyadhAchAryan vigraham to uyyakkoNdAr. uyyakkoNdar passes on the divine incidents and bhavishyadhAchAryan vigraham to maNakkAl nambi. maNakkAl nambi passes on the divine incidents and bhavishyadhAchAryan vigraham to ALavandhAr. ALavandhAr blesses iLayAzhwAr to be the next leader of our sampradhAyam. ALavandhAr passes on the divine incidents and bhavishyadhAchAryan vigraham to thirukkOshtiyUr nambi. It is established that just like pithrus feel happy and blessed when a vaishnava appears in their family, AchAryas before emperumAnAr felt happy and blessed when emperumAnAr appeared in the prapanna kulam. emperumAn, nammAzhwAr and emperumAnAr are identified as uththAraka AchAryas and it is explained how emperumAnAr fully manifests uththArakathvam. 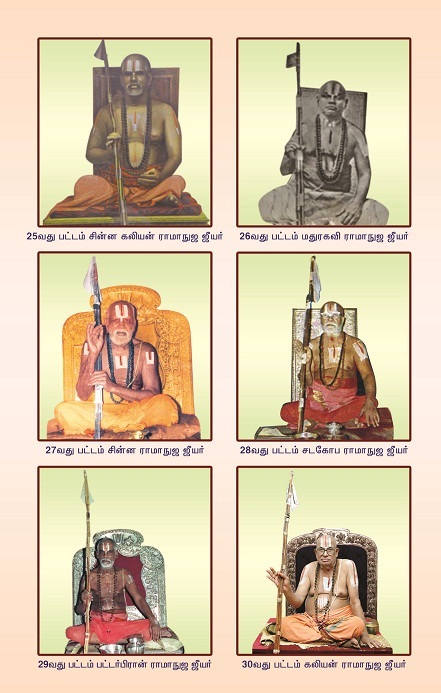 emperumAnAr's AchAryas namely periya nambi (mahA pUrNar), periya thirumalai nambi (srIsaila pUrNar), thirukkOttiyUr nambi (gOshti pUrNar), thiruvaranga perumAL arayar and thirumAlai ANdAn (mAlAdhArar) establish emperumAnAr's uththArakathvam by getting their own children to surrender to emperumAnAr and also through their words and action. 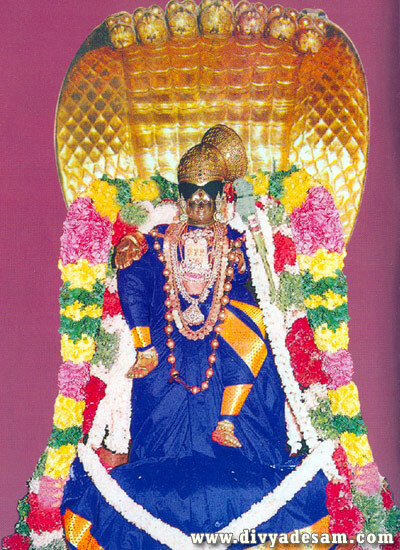 dhEva perumAL establishes emperumAnAr's superiority through thirukkachi nambi. He says just like he himself studied under various rishis during his vibhavAvathArams, emperumAnAr is also studying under various AchAryas now. It is also explained that since emperumAnAr established the proper sidhAntham and established the real greatness of emperumAn after advaithis and mAyavAdhis destroyed the same, emperumAnAr is the uththAraka AchAryan for emperumAn himself. So, we need not doubt his uththArakathvam for anyone else. His avathAra rahasyam is revealed. It is explained that he is the leader of nithya sUris, i.e., Adhi sEshan himself by thirumAlirunchOlai azhagar, kshIrAbdhi nAthan, brahma rakshas, sarasvathi and udayavar himself. 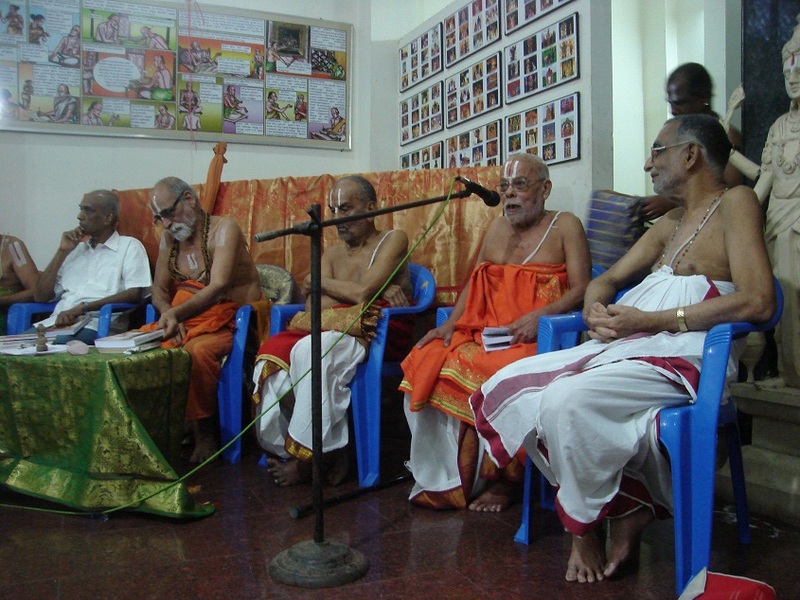 udayavar's glories are revealed by dhEva perumAL and AzhwAn, nammAzhwAr, etc. His glories are such that, many of his sishyas gave up their life (out of immense sorrow) immediately after hearing that he ascended to paramapadham. ALavandhAr's attachment towards nAthamunigaL and emperumAnAr is clearly explained and emperumAnAr's uththArakathvam is established by ALavandhAr himself. Greatness of charama parva (AchAryan) nishtai over prathama parva (bhagavAn) nishtai is explained. In the last 3 articles (http://ponnadi.blogspot.in/2012/12/charamopaya-nirnayam-ramanujar-our-saviour-1.html, http://ponnadi.blogspot.in/2012/12/charamopaya-nirnayam-ramanujar-our-saviour-2.html, http://ponnadi.blogspot.in/2012/12/charamopaya-nirnayam-ramanujar-our-saviour-3.html) we have fully enjoyed emperumAnAr's uththArakathvam. Now, we will continue on with the concluding section of this wonderful grantham. Note: This concluding section is fully based on many pAsurams from thiruvangathu amudhanAr's rAmAnusa nURRanthAdhi. This divine prabhandham was incorporated in to 4000 dhivya prabhandham by our pUrvAchAryas based on the thiruvuLLam of namperumAL himself who ordered this prabhandham to be recited in front of him during the procession in thiruvarangam streets. amudhanAr's faith towards emperumAnAr is extra-ordinary and the overwhelming emotions of him towards emperumAnAr can be understood by studying this rAmAnusa nURRanthAdhi. This prabhandham is called prapanna gAyathri - which means it must be recited atleast once a day (and preferably meditated upon all the time) by all srivaishNavas just like the gAyathri manthram which is mandatory for brAhmaNa, kshathriya and vaishyas every day. With this brief introduction for this final section, let us continue enjoying the same now. the residing place is where the srivaishnavas who are attached to emperumAnAr, happily glorify him. This is explained by amudhanAr 105th pAsuram as "irAmANuchanaith thozhum periyOr ezhuNdhiraiththAdum idam adiyEnukku iruppidamE" (இராமாநுசனைத் தொழும் பெரியோர் எழுந்திரைத்தாடும் இடம் அடியேனுக்கு இருப்பிடமே) meaning my place of residence is where the most knowledgable srivaishnavas who constantly glorify emperumAnAr live. the object of daily anubhavam while in this samsAram is constant meditation on the divine qualities of emperumAnAr. This is explained in the 94th pAsuram as "uvaNtharuNthEn avan chIranRi yAnonRum uL magizhNthE" (உவந்தருந்தேன் அவன் சீரன்றி யானொன்றும் உள் மகிழ்ந்தே) meaning I will not willingly enjoy anything other than emperumAnAr's divine qualities. So, this establishes that our enjoyable object is emperumAnAr's divine qualities only. This is also explained in the 2nd pAsuram as "irAmANuchan mikka chIlamallAl uLLAthen NenYchu" (இராமாநுசன் மிக்க சீலமல்லால் உள்ளாதென் நெஞ்சு) meaning emperumAnAr's limitless divine qualities are to be made the object of pleasure for charamAdhikAris (one who are in AchArya nishtai). what is to be avoided is associating with persons who do not enjoy meditating on emperumAnAr's glowing divine qualities. This is explained in 15th pAsuram as "irAmANuchan than piRanGgiya chIr chArA manicharaich chErEn enakkenna thAzhviniyE" (இராமாநுசன் தன் பிறங்கிய சீர் சாரா மனிசரைச் சேரேன் எனக்கென்ன தாழ்வினியே) meaning since I dont mingle/associate with the ones who dont enjoy/glorify emperumAnAr's limitless divine qualities, I have no defects. By saying that "I have no defects by not associating with such people", it clearly implies that "we will have defects if we associate with such people". When the ones who are related to emperumAnAr associate with the ones who dont have the relationship with emperumAnAr, it will affect the svarUpam. the object of speech/recitation is the glories of emperumAnAr always. This is explained in the 28th pAsuram as "irAmANuchan pugazhanRi envAy konYchip paravakillAthu" (இராமாநுசன் புகழன்றி என்வாய் கொஞ்சிப் பரவகில்லாது) meaning my mouth will happily speak nothing but the greatness of rAmAnujar. the object of meditation is emperumAnAr's lotus feet only. This is explained in the 35th pAsuram as "irAmANuchan mannu mAmalarththAL ayarEn" (இராமாநுசன் மன்னு மாமலர்த்தாள் அயரேன்) meaning I will never forget rAmAnujar's lotus feet. In the same pAsuram, it is said that "aruvinai ennai evvARu inRu adarppathuvE" (அருவினை என்னை எவ்வாறு இன்று அடர்ப்பதுவே) which means that constant meditation on emperumAnAr's lotus feet will drive away all my sins. It is also implied that forgetting emperumAnAr's lotus feet is undesirable. svarUpam is to constantly pray for loving service and subservience to srivaishnavas who are surrendered to emperumAnAr. This is explained in the 107th pAsuram "unthonNdargatkE anbuRRirukkumpadi ennaiyAkki anGgAtpaduththE" (உன்தொண்டர்கட்கே அன்புற்றிருக்கும்படி என்னையாக்கி அங்காட்படுத்தே) meaning bless me with attachment towards srivaishnavas who are fully surrendered to you and engage me in their service. should consider emperumAnAr's divine qualities of his divine form (vigraham) as the means to sustain oneself. This is explained in the 104th pAsuram as "unthan meyyil piRanGgiya chIranRi vEnNdilan yAn ... ivvaruL NI cheyyil dharippan irAmAnucha" (உன்தன் மெய்யில் பிறங்கிய சீரன்றி வேண்டிலன் யான் ... இவ்வருள் நீ செய்யில் தரிப்பன் இராமாநுச) meaning I do not need anything but the divine qualities of your vigraham (form) like saundharyam (beauty), etc and when you do not bless me with that I will not be able to sustain myself. should perform all kinds of services without any fault by mind , words and action to srivaishnavas who have full faith in emperumAnAr's divine names. This is explained in the 80th pAsuram as "irAmANuchan thiruNAmam Namba vallAr thiRaththai ... cheyvan chOrvinRiyE" (இராமாநுசன் திருநாமம் நம்ப வல்லார் திறத்தை ... செய்வன் சோர்வின்றியே). It is also shown that for the ones who does not have the faith in the divine names of emperumAnAr, it will be very difficult to accomplish the ultimate goal. This is explained in the 46th pAsuram as "irAmANuchan thiruNAmam Nambik kallAr agalidaththOr ethu pERenRu kAmipparE" (இராமாநுசன் திருநாமம் நம்பிக் கல்லார் அகலிடத்தோர் எது பேறென்று காமிப்பரே) meaning the people of this world who does not have faith in his divine names will be searching for the ultimate goal for ever. I promise 3 times (emphasis) that yathirAjar is the AchAryan for the whole universe. He is the saviour for everyone and there is no doubt about this. As shown in the 62nd pAsuram as "irAmANuchan mannu mAmalarththAL poruNthANilaiyudaip punmaiyinOrkku onRum Nanmai cheyyA peruNdhEvaraip paravum periyOr tham kazhal pidiththE" (இராமாநுசன் மன்னு மாமலர்த்தாள் பொருந்தாநிலையுடைப் புன்மையினோர்க்கு ஒன்றும் நன்மை செய்யா பெருந்தேவரைப் பரவும் பெரியோர் தம் கழல் பிடித்தே), the unfortunate people who does not take shelter of the most worshippable and enjoyable lotus feet of emperumAnAr will suffer in this samsAram for ever and the ones who have taken shelter of the lotus feet of emperumAnAr will have all their desires accomplished. Thus ends the translation for charamOpAya nirNayam.